Media: Three Sheet Letter Size 8.5" x 11" Cardboard Foldout (six pages) with Thirty Polyurethane Paint Samples. 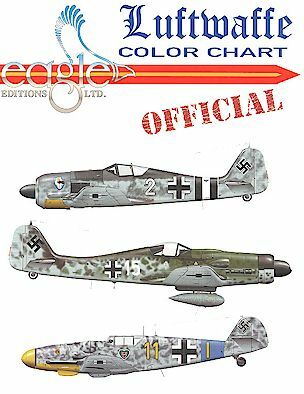 Total Foldout Size 24" x 11"
Luftwaffe colours are hotly discussed at Model Clubs, on the Internet and in the editorial pages of magazines. It is therefore surprising that published colour samples are relatively rare. The limitations of printing in process colours means that the exact tones of Luftwaffe colours cannot be reproduced accurately in a conventional book. The only accurate way to present these colours is using paint samples. Eagle Editions' "Luftwaffe Color Chart" supplies thirty paint samples of Luftwaffe colours covering primer, export, marking, pre-war and wartime camouflage colours. At 2" square, each colour chip is usefully large. The colours are organised in ascending RLM number order on three fold-out pages of medium-weight cardboard. One of the late-war "Sky" colours is also presented without an RLM designation. The remaining pages contain three colour profiles by Tom Tullis (the front cover), a Certificate of Authenticity from Warnecke and Bohm GMBH (one of the principal suppliers of paint to the Luftwaffe during World War Two) and a description of the use of each RLM colour. The document notes that the colours would be affected by weathering and different application techniques. It also notes "scale perspective". In other words, a colour should look lighter on a smaller scale representation. However, the amount that the colour is lightened to compensate for scale is more of an art than a science - add white to taste! This colour chart will be an invaluable, one-stop resource for Luftwaffe modellers and historians. It is good value too. A must for every Luftwaffe modeller's reference shelf! Available from Eagle Editions Website or Hobby Retailers. Thanks to Judy at Eagle Editions for the sample. This Page Created on 10 February, 1999.